Compare funeral directors in North Shields and read verified reviews on the UK’s online funeral resource. Use Funeral Zone Listings to find local funeral directors in North Shields that meet your specific needs. You can organise the search results by ‘best rated’, 'nearest' or ‘most reviewed’. There is also a handy Google Maps feature so you can see exactly where each funeral home is in relation to each other. 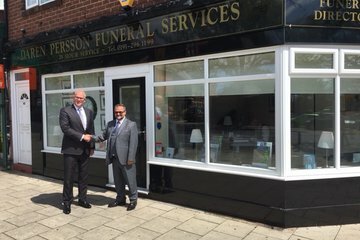 I used Darren Persson Funeral Directors when my father passed away. I found this company very attentive to my wishes and presentation was perfect. Handled in a very friendly manner,I could not fault the staff involved in any way at all. Thanks again for your help and service at this sad time. Dek Walters. Thoughtful and caring, all the staff helped us through a painful and difficult time giving good advice and support. First class service. Would recommend to anybody that asked, highly professional.